Campus Compact’s 34 state affiliates are CEEP’s prime partners. Campus Compact is a national coalition of almost 1,200 college and university presidents — representing some 6 million students — who are committed to fulfilling the civic purposes of higher education. As the only national higher education association dedicated solely to campus-based civic engagement, Campus Compact promotes public and community service that develops students’ citizenship skills, helps campuses forge effective community partnerships, and provides resources and training for faculty seeking to integrate civic and community-based learning into the curriculum. 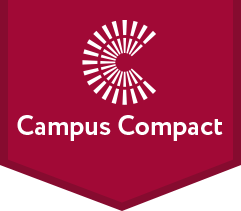 Campus Compact members include public, private, two- and four-year institutions across the spectrum of higher education. These institutions put into practice the ideal of civic engagement by sharing knowledge and resources with their communities, creating local development initiatives, and supporting service and service-learning efforts in areas such as K-12 education, health care, the environment, hunger/homelessness, literacy, and senior services. Rock the Vote’s mission is to engage and build political power for young people in our country. They use music, popular culture, new technologies and grassroots organizing to motivate and mobilize young people in our country to participate in every election. Founded in 2005, Nonprofit VOTE partners with America’s nonprofits to help the people they serve participate and vote. They are the leading source of nonpartisan resources to help nonprofits integrate voter engagement into their ongoing activities and services. The Election Protection works to ensure that all voters can participate in the political process. In 2000, millions of voters, primarily in minority communities, were denied the right to vote through poor voter education, intimindation poorly trained poll workers and malfunctioning voting machines. Long Distance Voter is a comprehensive resource for registering and voting by mail. LDV aims to simplify the absentee voting process by gathering all the information in one place and organizing it into easy-to-read voter guides. Prior to LDV’s launch, there was no centralized resource for absentee voting. Student Veterans of America’s mission is to provide military veterans with the resources, support, and advocacy needed to succeed in higher education and following graduation. SVA’s vision is that all veterans succeed in higher education and gain meaningful employment. The student members of the United States Student Association work with a vision for a just society in which generations of representative leaders understand their power and engage and empower diverse communities to create social change.